Graffiti, a botched photo sitting requiring a retake, and a desire to recreate a famous photo have resulted, 145 years later, in the discovery of a stereo photograph of General Robert E. Lee. Careful study of not just the images of Lee but the precise location of Lee's stance on brick flooring and the identification of the camera angles, indicates images taken minutes apart could be adjusted for size and exposure to provide a true stereo pair. 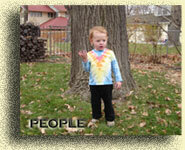 This stereo image was not lost; it was merely unrecognized. It is only the third known stereo of General Lee and the only one of him in uniform. How would you like to OWN a bit of this history? 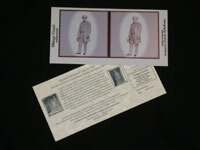 Purchase a stereo view card showing General Robert E Lee in uniform. While not quite the resolution of the stereo slide, this is a convenient way to share views of the General in all his 3D-ness without needing a stereoscope. 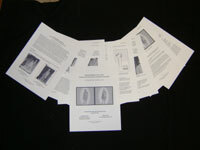 The back of the view card also has a short description of the image and its discovery. Purchase a copy of the paper that describes the details of this discovery. Additional details (such as a question about Lee's vest), lots of photos (including a detail image of the graffiti itself), and references are all included. 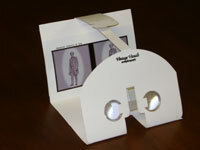 Purchase both a stereo slide and a stereo view card. 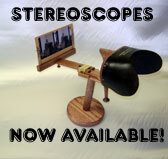 Purchase a stereo slide and a copy of the full paper. 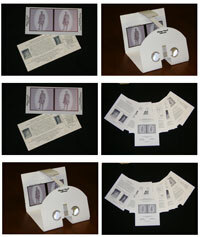 Purchase a stereo view card and a copy of the full paper. Your choice! For those who want it all, purchase all three items at a special price. Slide, view card, and paper all for just $50. 3-D Photography - Just Like Real Life! 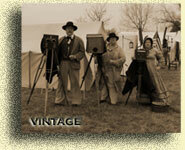 Vintage Visuals provides expertise and service in stereo photography. 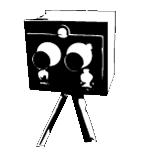 Specializing in capturing and creating vintage Holmes-style stereo photos and stereo viewing devices, Vintage Visuals brings the photographic image alive. 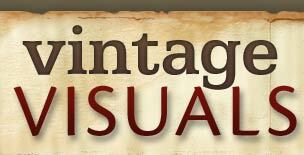 Vintage Visuals also provides education in 3-D concepts, techniques, applications, and history. 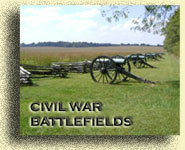 In fact, through Alive With History, Vintage Visuals offers first person historical presentations of Alexander Gardner, the premier Civil War photographer. More Questions? Check out the notes section on the Vintage Visuals Facebook Page. If those aren't enough, you can "Ask Alex" and he will post an answer. 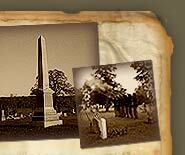 Would you like to meet Alexander Gardner, the Premier Civil War Photographer, in person? 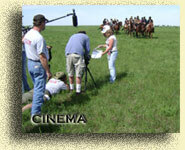 Would you like detailed lessons from a real expert in how to make stereo photographs? 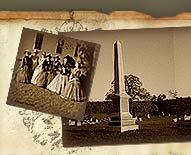 Visit Alive With History and find out how! Already a Vintage Visuals Fan? Vintage Visuals has everything you need to experience images the way you were designed to see them - with two eyes in 3-D! We take photos and process them into stereo pairs. 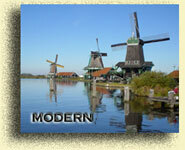 We mount these stereo images on a vintage-type photo card in order to create the vivid 3D viewing capability. 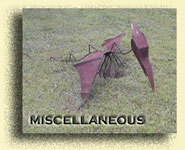 We add words to the back of this card so you can always remember the details of the stereogram. We hand craft Holmes-style stereo viewers so that you can see our life-like 3D images (of course you can also use an antique stereopticon - our cards will fit).